CHICAGO – Shoppers clicking “buy” on smartphones, tablets and laptops spent almost $20 billion online from Thanksgiving through the following Monday. Now retailers have to turn that spending spree into a flood of cardboard boxes on their way to shoppers’ doorsteps. To keep up, both retailers and United Parcel Service are trying to give customers accustomed to quick deliveries a few incentives to be patient. Monday marked the biggest day of online sales in history, with consumers shelling out $6.59 billion at the top 100 U.S. retailers, according to Adobe. The record comes with a challenge: handling a sudden surge in orders without disappointing customers who expect their packages to arrive on schedule. Amazon for a few years has given customers in its Prime membership program, which includes two-day shipping, the option to accept slower delivery in exchange for credits to spend on videos, music or restaurant orders. But this will be the first holiday season Macy’s has offered all customers at high-volume times a similar choice, after a test in some markets last fall. Macy’s “no hurry shipping” lets customers opt for a longer delivery time in exchange for an incentive. On Cyber Monday, customers willing to wait six to nine business days were offered Macy’s Money that could be used on future purchases, though the reward can vary, said spokeswoman Andrea Schwartz. By Tuesday, Macy’s was no longer offering the “no hurry” option, but it will be back in the days before Christmas and other popular gift-giving holidays. That might mean packages arrive after the holiday, but some customers are buying for themselves and don’t have a hard deadline, Schwartz said. Levi’s, meanwhile, offers economy shipping, which promises delivery within six to eight business days for $4.95, instead of the standard three to six business days for $7.50 within the continental U.S.
Sheryl Burritt, of Morton, Illinois, shopping at Oakbrook Center on Monday, said she might consider waiting if shopping for herself, but would worry about willingly slowing the arrival of gifts for others. “I feel like if I don’t get it right away, I might not get it in time for Christmas,” she said. But Katie Clunk, of Portland, Oregon, said she doesn’t mind waiting for Amazon’s no-rush option when the retailer offers an appealing reward. “It depends on how badly I need it and whether the promotion is worth it,” said Clunk, shopping with her mom while visiting family over Thanksgiving. As stores have turned free or faster shipping into a way to compete for sales, customers’ expectations have risen. Nearly 90 percent of Chicago consumers think “fast shipping” means delivery within two days, compared with just 53 percent in 2016, according to a survey by consultancy Deloitte. But free still beats fast, according to an overwhelming 86 percent of Chicagoans surveyed by Deloitte. For retailers, encouraging customers to wait for packages is a no-brainer, said Bobby Stephens, a senior manager in Deloitte Digital’s retail practice. As the holiday shopping season stretches earlier and earlier into November, most consumers don’t actually need orders to arrive right away. Spreading them out lessens the impact on a retailer’s supply chain, and offering a store credit could encourage another purchase, he said. “I think the incentive ends up being worth it to not have to deal with the customer service ramifications of not delivering on time,” he said. It also could help retailers avoid extra costs that one major package shipper added to help cope with the surging volume of packages. 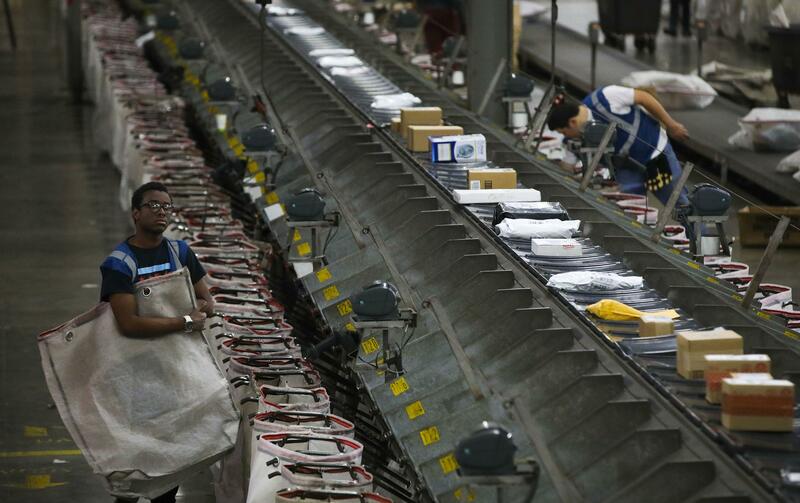 In June, UPS announced new surcharges for deliveries during the busiest holiday weeks. The fees add 27 cents for residential deliveries between Nov. 19 and Dec. 2 and Dec. 17 to Dec. 23, or up to 97 cents for faster shipping during the latter period. UPS ships more than 19 million packages on a typical day. But that figure frequently topped 30 million during the 2016 holidays, UPS said. The company expects to deliver about 750 million packages worldwide between Thanksgiving and New Year’s Eve, roughly 5 percent more than last year. It’s too soon to say how the peak charges are affecting shipments, but the holiday delivery season is “off to a good start,” said UPS spokesman Matthew O’Connor. Published: Dec. 3, 2017, 4:16 a.m.